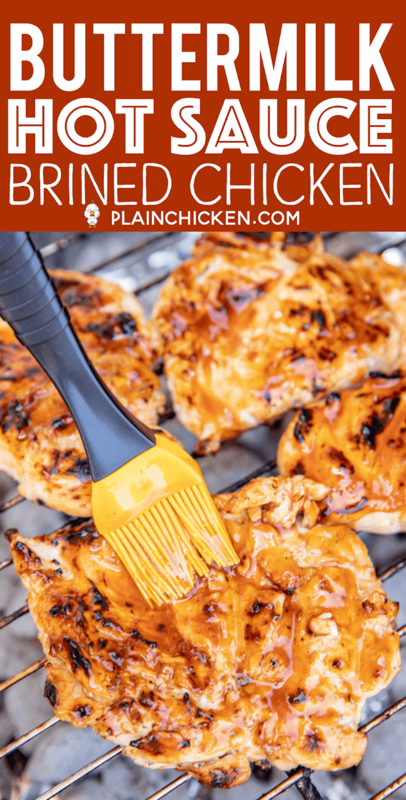 This Buttermilk Hot Sauce Brined Chicken is CRAZY good! SUPER tender and SUPER juicy. We ate this for lunch and dinner the same day. It was that delicious. It is so good that we've added to the menu again this coming weekend. I can't wait! 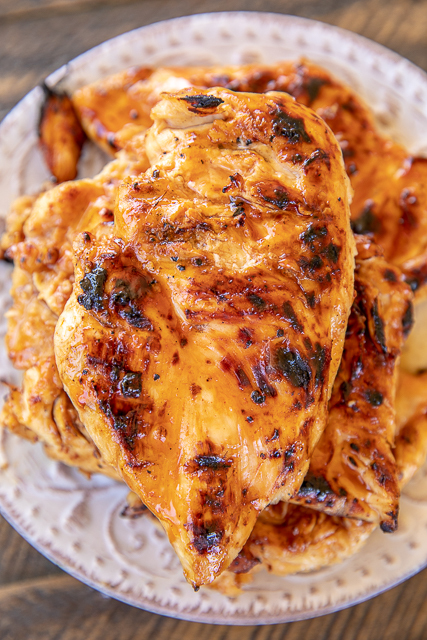 Even though the chicken is marinated overnight in hot sauce, it isn't spicy at all. I used Frank's Hot Sauce. I linked to it in the recipe below. You can also use Crystal's or Texas Pete's hot sauce. 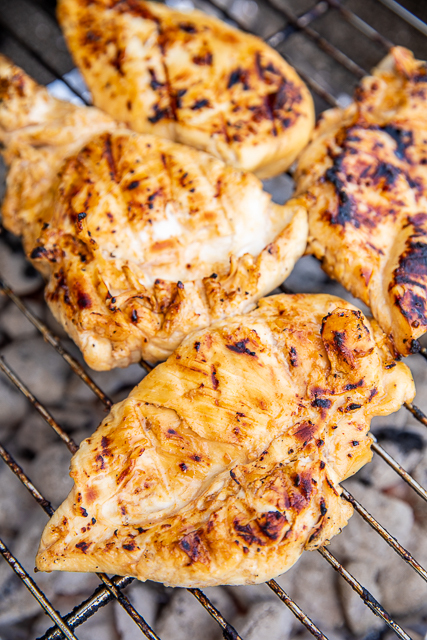 We brushed the chicken with some BBQ sauce spiked with hot sauce before taking it off the grill. YUM! 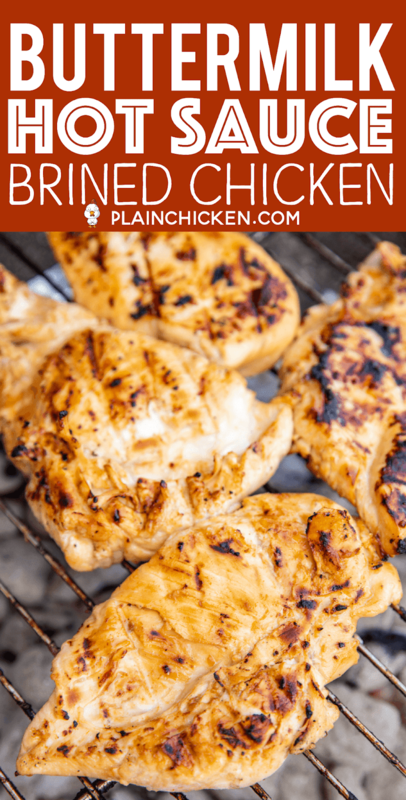 The brine/marinade is super simple to make. You just need to plan ahead since you want to let the chicken soak for about 24 hours. If you don't have that much time, just give it as long as you can. 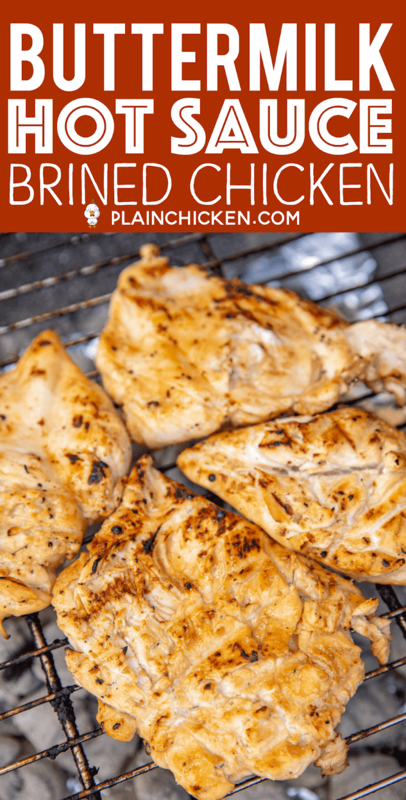 I used boneless chicken breasts, but you can use chicken tenders, chicken thighs or bone-in chicken. You will just need to adjust the cooking time depending on which cut you choose. Whisk together buttermilk, water, salt, pepper, 1/2 cup hot sauce, brown sugar until sugar is dissolved. Stir in lime slices and garlic. Place chicken in a gallon ziplock bag. Pour brine over chicken and seal bag. Refrigerate 24 hours. 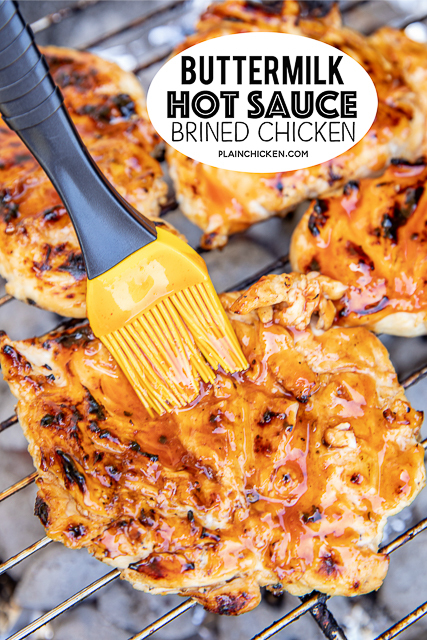 Combine BBQ sauce and 1 Tbsp hot sauce. 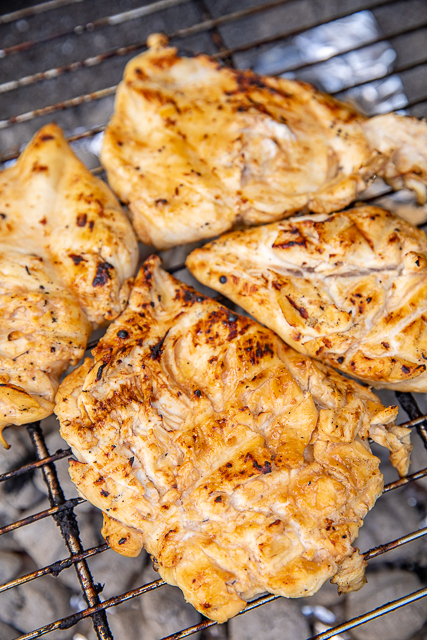 Grill chicken 12 to 15 minutes, until internal temperature reaches 165ºF. Brush chicken with BBQ sauce mixture on each side before removing from grill. Sounds delicious and must be tried. looks very good. Think fat free buttermilk would work? sweetpea - I made this with full-fat buttermilk. Unfortunately, without further recipe testing, I cannot answer with certainty. As always, please use your best judgment regarding substitutions and modifications. Yum! 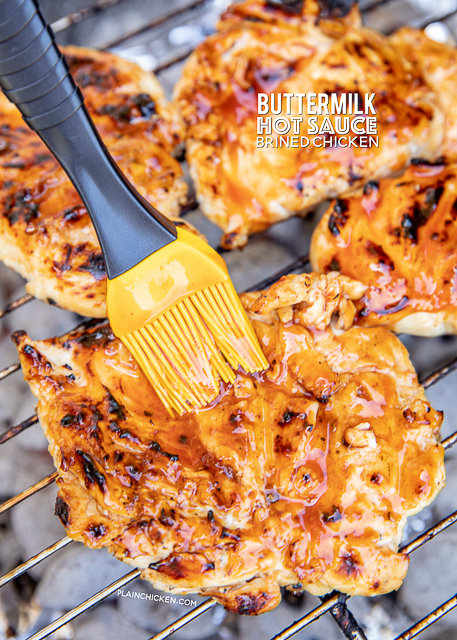 I vaguely remember seeing something about soaking your meat in buttermilk, but then never went back to it. This looks amazing -- can't wait to try! thank you! Maybe I'll try what I have (fat free) with a bit of melted butter thrown in!! 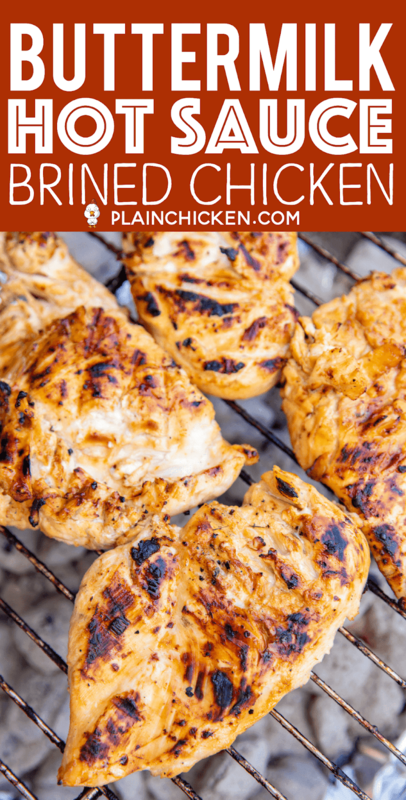 Buttermilk brine is the key to moist chicken whether it be baked, grilled or fried. I believe that fat free buttermilk will not satisfy for this recipe. You suggestion about 24 hrs to marinate is spot on. If time allows I like to do 36 hrs. but never less than 24 hrs.